Still love this! The colors are gorgeous, I like the green, teal with gold trim, it's beautiful together! The draggie work in this doll is just incredible! You made this in the Mermaid maker! Guys, blue made this in Azaleasdolls' Mermaid Creator! Holy cow! OMG the dress, the hair, the whole doll is just ahhhhhh!!! so beautiful!!! Oh this is so neat! I love the pea on the pillow, what a cute idea! 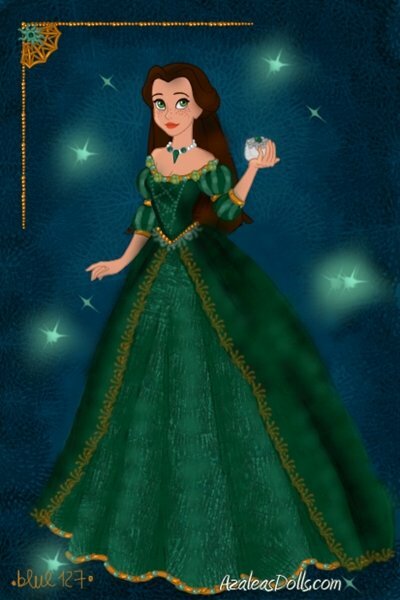 Her dress is stunning too, I love the deep green and gold trim. Also her sleeves and corset are lovely! Eeek! I adore her dress! All the varying shades of green/teal work beautifully together and really call to mind the frog prince without being obvious. Love, love, love! HOW DID I MISS THIS. its amazing! !